President’s Cup Winner-Detroit Red Wings STANLEY CUP 2008 Commemorative Panoramic Print–A great panorama shot of Joe Louis Arena during last year’s Stanley Cup finals. Post-Season Cinderella Story–Vincent Lecavalier SUPERSTAR Poster–Of course we picked the face of Tampa Bay’s franchise, Vinny Lecavalier to represent his team on this blog. Stanley Cup Runner-Up/Eastern Conference Champion-Daniel Briere SUPERSTAR Poster–Danny Briere should be able to lead the Flyers deep into this year’s playoffs. 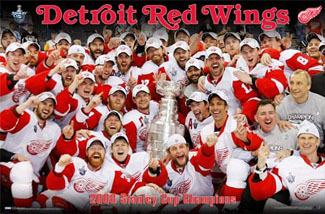 Stanley Cup Champion-Detroit Red Wings CELEBRATION 2008 Poster –The staff at Sports Poster Warehouse believes that the Wings can AND WILL REPEAT! For these posters and more, visit www.sportsposterwareohuse.com. For more promotions, events and news, join our self-titled Facebook group! This entry was posted on September 18, 2008 at 1:49 pm and is filed under Uncategorized. You can subscribe via RSS 2.0 feed to this post's comments.